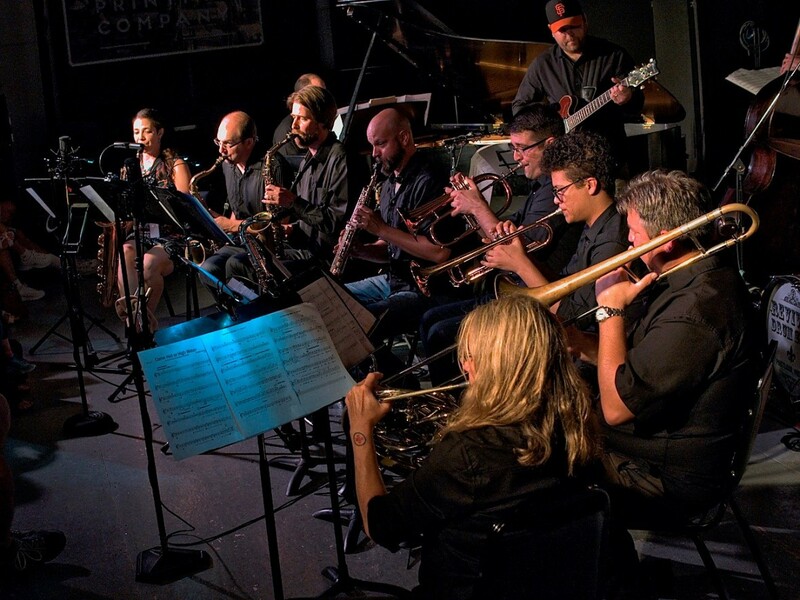 The Portland Jazz Composers’ Ensemble is a 12-piece jazz chamber orchestra which commissions and performs original works by its members and by other jazz composers in the Portland music community and beyond. It is our mission to operate a large musical ensemble, to commission and perform original works by members of the ensemble and by other jazz composers in the Portland music community and elsewhere, to act as a forum for the development and presentation of works for large ensemble by established and emerging jazz composers, and to engage and enrich community awareness and appreciation of contemporary music. We also operate a grassroots label, PJCE Records, which releases albums of original music by local jazz artists. The PJCE was founded in 2007 by pianist Andrew Oliver and saxophonist Gus Slayton after the pair graduated from Portland State University. Along with a particularly vibrant group of student composers in the PSU big band that year, they wanted to continue to create new music for large ensemble. The first concerts were informal and exciting examples of a like-minded group of young musicians getting together to create new sounds and experiment with the textures of large ensemble jazz. The Portland Mercury called the PJCE’s second show “the most strikingly punk show I’ve seen in years,” and the band went on to premiere over 20 new compositions by Portland composers in its first few years of existence. As the organization evolved and matured, the PJCE continued to commission and perform new music for large ensemble by an increasing variety of established and emerging Portland-area composers while also establishing itself as a nonprofit corporation in 2010. The administrative team expanded with the addition of Dan Duval soon thereafter, and in 2013 Andrew and Dan co-founded PJCE Records, a new record label branch of the organization, filling a void in the Portland music scene by documenting the rich variety of small group jazz and creative music being created by local composers and improvisers. In the first year of its existence, the label released one album per month, often recorded in informal live sessions designed to reflect the immediacy of the music’s creation and the natural sound of the groups. The label, now under the direction of Ryan Meagher and Douglas Detrick, continues to regularly release a wide variety of high quality original music by Oregon artists. In 2013, Andrew Oliver moved to London and Douglas Detrick was elected Executive Director upon his departure. Since then, the organization has expanded its scope to include collaborations with special local and national guests such as John Gross, Taylor Ho Bynum, and Catherine Feeny and a variety of themed concerts tying into elements of local history and culture. The PJCE launched its podcast Beyond Category in 2015 to expand the organization’s platform and give artists an opportunity to share their stories and music with a wider audience. Tom Wiederrecht, Treasurer, CPA, Gary McGee and Co.